I am in the process of getting my certification and which one is widely recognized and which would be likely to a making a living.....Which one is more popular? I was to pass the first time if I can the exam..... Passing exam percentage? I would go with a regular CPC over CPC-P. I work for an insurance company and was told CPC will go a lot further. I was told there are so few CPC-P that it may become a discontinued credential one of these days. I don't plan on taking CPB until i complete my CPC. I may do the CPC-P next as i already have a background in reimbursement. How long until the test results return? I too am on pins and needles waiting to see if I passed. I feel really good about it, I only guessed on a few and I felt confident in my answers. I hope I'm not delusional about how I did! How soon can the results come back? I took mine on 7/16 so it's been 5 days since. I've been checking the aapc website 2-3 times a day! I know this thread is a little old but what helped me is definitely going through the guidelines and conventions in both the ICD-10 and CPT; going through the chapter specific guidelines, just over and over, knowing where everything is in all your code manuals too and believe it or not, in your CPT, instead of tabbing the side with all the tabs that came with it, put those tabs on the top and bottom and then create your own tabs, 0-9, and put the zero tab at the start of your 00 codes, your 1 tab on the start of your 10000-19999 section, 2 tab at the start of the 20000 codes, etc. It helps tremendously with finding your codes speedy quick. Know where your drug codes are on in the HCPCS and the modifier section in the HCPCS, tab those so you can refer to them quickly. Also, in the CPT, read your parentheses under the codes you look up, you'll miss a few if you don't! Watch missokieok's videos on youtube; excellent free information on ICD-10 and more importantly CPT coding, I watched all of them and literally came to understand some of the more difficult procedures thoroughly. Very helpful. I got a 69% the first time. I just took it again and feel like I did worse!! Uugh! 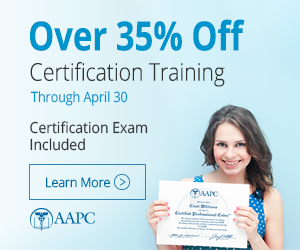 Does anyone know if your score for a certification exam is ever posted on a weekend. The status says received, but I wondered if I had to wait until Monday to get my grade?